Sydney, one of Australia’s largest cities, is famous for its iconic harbor, the Sydney Opera House, and the Harbor Bridge. 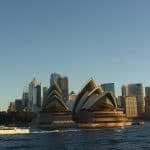 There is plenty to see and do in Sydney. But it also has a large crescent of sandy shoreline that captures the true essence of the Aussie lifestyle. There are over 100 stunning beaches that dot the breathtaking coastline of the city, each one with a personality all of its own. 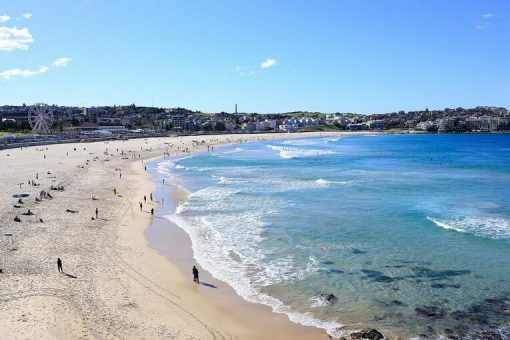 One of the most famous is Bondi Beach because of the all the activities that the area has to offer. In fact, locals lovingly refer to the area around Bondi as the “Bondi Bubble.” You don’t even have to swim when you visit, but when in Australia (where beach culture is in the blood) it is customary to ride the waves. Bondi Beach is 4.3 miles (7 Km) East of Sydney. You can get there by Uber in twenty minutes or take public transportation. Express buses run from the city center to Bondi Junction Station and take about 30 minutes. Once there, plop down your beach bag and catch some waves. When hunger strikes, sit at a coastal café or grab a takeaway fish and chips. Walk off lunch and make the 2.5-mile walk from Bondi to Bronte or hit the stores for some top-notch shopping. Your day at Bondi Beach will be as busy or as relaxed as you want it to be. 1. Take a surfing lesson. 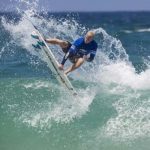 Lessons for beginners and intermediate surfers start around $79.00. The experience covers everything you need to know, bring a suit, a towel, and get ready to surf like a local. 2. Grab a picnic lunch at Fishmongers. Order grilled or battered fish, chips, and freshly shucked oysters. Dine in the casual café or take your catch alfresco and picnic on the grassy cliffs that overlook the Pacific Ocean. 3. Stretch your legs and take a picturesque, 2.5-mile walk from Bondi Beach to Bronte Beach. At Bondi, there is an entrance to a cliff-top trail that connects to two other stunning beach areas, Tamarama and Bronte, which provide breathtaking views of the water. There are plenty of cafes and places to grab snacks along the trail, but if you are need of refreshment when you arrive in Bronte, take a dip in the 98-foot long human-made ocean pool or smaller, natural rock pool that can be found at the south end of the beach. Both pools are free of charge. 4. Back in Bondi, visit the world-class stores. PACIFIC Bondi, a new development of residences, a boutique hotel, high-end retail and dining opened just off the beach on the street known as Campbell Parade. An eclectic mix of shopping mall and residences, at Pacific Bondi, you will find clothing, accessories, wellness offerings and plenty of dining options. There are several shops on the surrounding streets around Campbell Parade, with trendy ladies and menswear, sunglasses, swimwear, and shoes. 5. Before you wrap the day, take a walk to Hall Street and stop in at Gelato Messina, one of the best gelaterias in Sydney. t Gelato Messina, they use all-natural ingredients, make everything from scratch and develop new and exciting flavors (they boast forty different varieties so far). The company serves the best sweet, cold ice-creams, sorbets and cakes that you can imagine. A stop here is a refreshing finishing to a fantastic day at the beach.